The solid epoxy coating is durable and highly resistant to stains, spills, chemicals, and other wear as well. It is fast and easy to install and will improve the appearance and life of your concrete floor. The solid epoxy coating can do wonders to your floor, but it’s essential to get the installation right to experience any of the benefits associated with solid epoxy flooring. The first thing to consider when applying any coating over a concrete substrate is the adhesion rating. The adhesion rating will tell you how well the coating will adhere to the surface. Anything under 300 PSI on an adhesion rating means it can separate from the concrete. The second thing to consider is the impact rating. The impact rating will give you insight into the amount of impact the coating can withstand. Anything less than 75-inch pounds on the Impact Rating is poor. With SealMaxx, you won’t have to worry about any sub par installation methods. 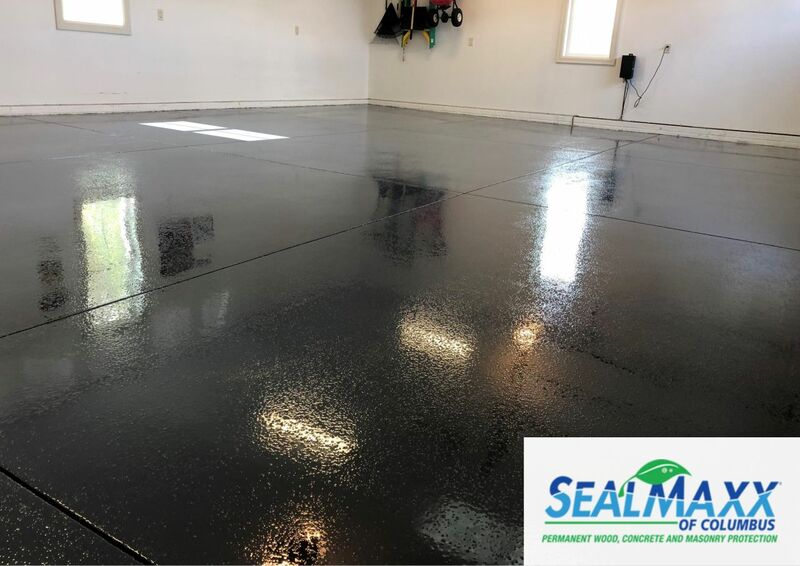 With over 1 Million Sq Ft of concrete sealed, it is no surprise that SealMaxx is the most trusted option for homeowners and business across Columbus, Ohio. Our coatings always hold up to rigorous specs and testing. Incredible Appearance: Compared to regular garage floors, solid epoxy floors are bright and neat making them more enticing to use. Easy Maintenance: These floors have a smooth and even surface making them easy to sweep and maintain. Low Costs: These floors can be installed directly over concrete making them quick to install and less expensive than most other options. Resistance: Solid Epoxy floors are highly resistant to oil, gasoline, bleach, transmission fluid, cleansers and a lot more. Durability: Solid epoxy floors have a longer lifespan than most other floor types. Protective Qualities: Protects the underlying concrete from moisture, stains, grease, and cracks. Longevity: When properly installed, the epoxy floor coating can last for many decades without cracking or peeling.